signs of aging and fatigue. Formulated without fragrance and tested under ophthalmological supervision,CHRONO EYES is suitable for sensitive eyes and contact lens wearers. Gently pat onto the eye contour. Smooth under the eyes and on crow's-feet. Apply morning and evening. 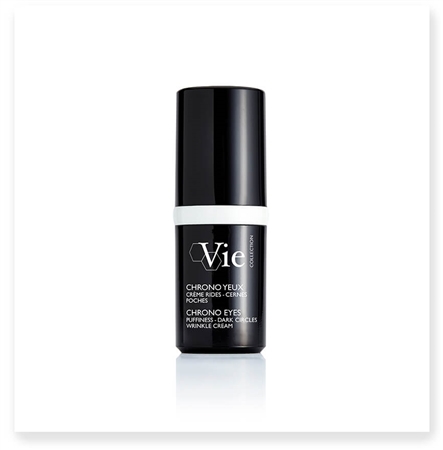 • Encapsulated high molecular weight hyaluronic acid - controlled release of ingredient for lasting effect. Swells on contact with water in the dermis to add volume to hollow areas and fill deep wrinkles. • Botox-like peptide - works to relax muscles, frown lines and crow's feet. • Phytosterols + Fatty acids- stimulates the elimination of fat deposits that cause under-eye puffiness. • Vitamin C + Vitamin B3 - stimulates the skin's microcirculation by increasing blood flow. Brings radiance to the skin.